An eagle-eyed poster on a German music technology forum has discovered that Roland has made an application in Germany to trademark the designs of its iconic TB-303 Bassline synth and TR-808 drum machine. 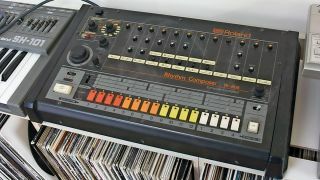 The story has been picked up by CDM, which reports that, in 2018, Roland also applied for trademark protection for the TR-808 and TR-909 in the US, suggesting that the company is gearing up for a fight with those who may seek to exploit its heritage. For those who are interested in its policy on these matters, Roland has a page dedicated to Intellectual Property and Brand Protection on its website. We’re no experts on intellectual property law, but you may wonder why Roland hasn’t taken these steps before. Some are suggesting that the company’s decision to act now may be a response to Behringer’s imminent launch of the RD-808, a drum machine that the company describes in a promotional video as a “tribute” to the original 808. However, it’s worth pointing out that there have been plenty of Roland-inspired instruments before, both in hardware and software. For its part, Roland offers the TR-08 drum machine and TB-03 synth, both of which are styled to look like their famous forebears. As Behringer also noted, IP disputes between musical instrument companies aren't uncommon. Only last month we reported on Electro-Harmonix's victory in a copyright case that it brought against Chinese pedal manufacturer Mooer. Looking at Roland’s German patent applications - though Google Translate, it must be said - it appears that the company is seeking to protect its designs not only in relation to music technology gear, but also clothing and shoes. Whether we’ll see any obvious ramifications of Roland’s application remains to be seen, but we’re sure we won’t be alone in monitoring the situation carefully.